Everyone is familiar with 1969 Z-11 Camaros, commonly called Indy Pace Car replicas. There were 3,675 produced, all convertibles, and many of them are still around. But are you familiar with the Z-10, the coupe version that has the same paint scheme of Dover White with Hugger Orange stripes? Your location could have some bearing on that. Per the CRG (Camaro Research Group), They were sold only in TX, OK, NM, LA, AZ, and western TN. This one is located near Phoenix, AZ, and is for sale here on Craigslist for $32,500. Reported to be an original Arizona car, it spent many years in dry storage. Production figures of Z-10’s aren’t known for sure, but the CRG estimates a total of 450 to 500 units were produced. All were RS/SS models and were equipped with front and rear spoilers, rally wheels, and cowl induction hood. The vinyl top was optional. The seller thinks the vinyl top cars are very rare, but the CRG says many were so equipped. This car also has power steering, power front disc brakes, air conditioning, and a tilt steering column. It has original paint and all original sheet metal. There are some dents and dings, but overall the body appears to be in exceptionally good condition. The Z-11 cars came with deluxe orange houndstooth interiors. However, there are no Z-10’s known to have that interior. 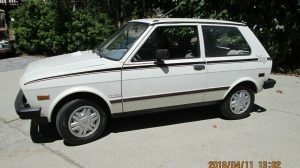 Several interior options were available, but approximately half of them were equipped like this, with the ivory standard interior. 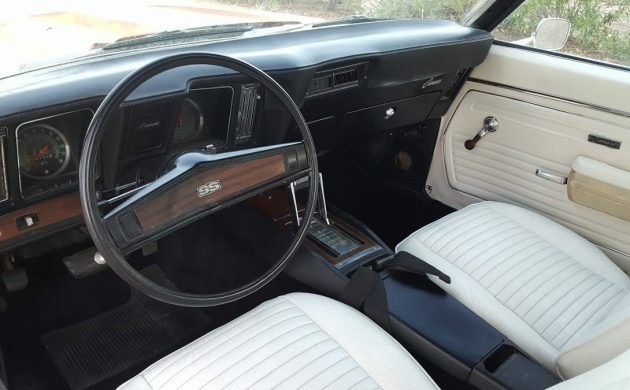 This interior looks original and appears to be in good serviceable condition. Often the dash pads are cracked but this one looks good. The odometer reading is 95,000. 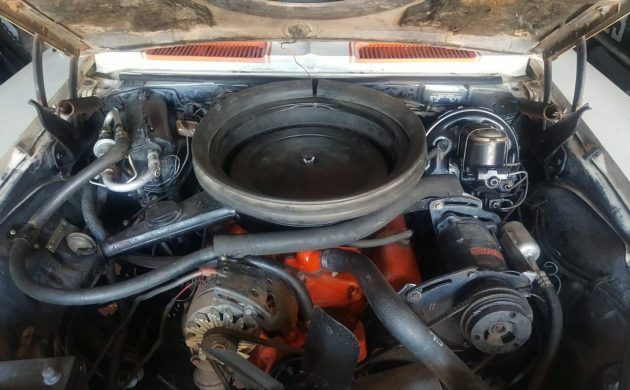 The engine bay appears unmolested, but the seller doesn’t say whether or not this is the original, numbers matching engine. He says it “has a correct 350/300hp motor”. It may or may not be a replacement, I won’t speculate. The seller would have to be questioned regarding this issue. The transmission is a 350 turbo and the rear is a 12-bolt. 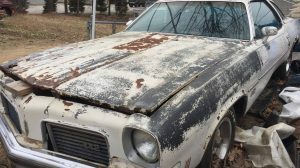 This looks like a really sweet Camaro for either driving as-is or restoring to the max. What would you do with it? 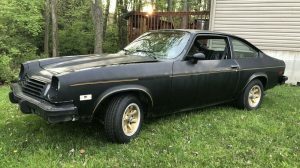 One here in my town in East Tennessee, have tried to buy it for years…..guy will not sell and never drives it…..sigh….garage kept and a great car…..will keep trying, does have the Z-10 code…. Great car and based on the rarity and combined originality the $32k asking price is by all accounts VERY fair money. What’s not to love? What would I do with it? Keep it detailed and maintained to the highest order and drive it as much as possible! 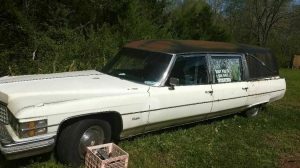 Could have had one for $1,000 in 1984 but had already bought my 62 Impala. Lived in Memphis, TN and remember when a classmate drove his new Z10 Camaro to high school for the first time. His father bought it for his senior year. I’ll never forget the crowd of students around his car that day. We thought it was some kind of race car. One of my top 10 all time favorites. Cool find! Never knew these hardtops existed. Grew up seeing the convertibles all over but we’re only an hour away from IMS so pace cars of all vintages are common. Sister’s ex bf still drives his ariund town on nice days. I audibly gasped when I saw the picture and article title. White on white with orange stripes is stunning. Oh how I would like to own this. I claim to think I know a far amount of the 1st and 2nd gen. camaros. But I never claim to knowing everything! Case in point,never knew they made 69 pacecar hardtops. I will look that up in my old camaro “white book”. That was always the holygrail of facts.I believe it now and this example looks great. I would keep it maintained,and drive it a bit,but not to much. I grew up in south Texas gulf coast and had a cousin that had one of these. We had no idea what it was at the as far as a “pace car coupe”. 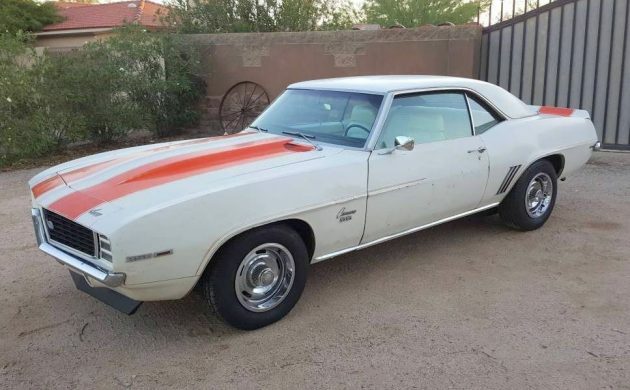 We knew that since it was a white with orange stripes deluxe white interior SS/RS, and we had never seen another like it, it must have been pretty rare. It had a 350/ th350 and no vinyl top. Cant remember if it had ac or not. I remember he and my uncle built a pretty stout 355 for it, not sure if it was the original engine or not. It was kinda rusty though. It was his driver and he had a guy sand blast it and was still driving it in primer. The guy who was going to paint it to him to drive it for a while to work the sand out before paint. Every time he would stop somewhere it would leave little piles of sand! I recall that he found quite a bit of rust in the cowl and decided to part ways with it. Kind if a shame as they had taken care of the other rust with patch panels. I learned i would never sand blast a car! It would have made a nice mate to my late brother’s pace car that was featured on here a couple of years ago. Is it me, or do the tail light lenses look a bit odd? Odd this has a turbo 350 trans, but the milder low compression ’74 z28 350 has a turbo 400 auto trans. Maybe cause of the weight difference of the cars? 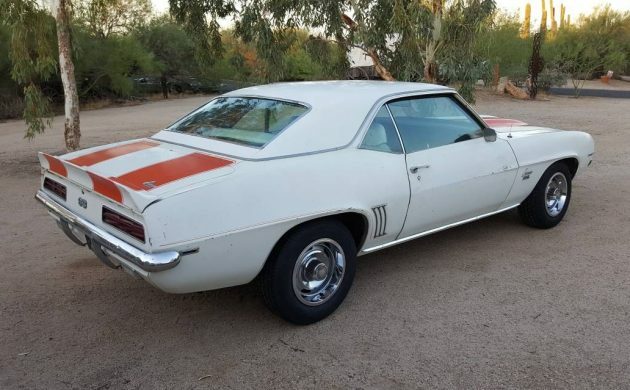 I may be getting older, my vision is probably not getting better & I’m definitely not a Camaro expert, but is there any vinyl on that top? I cannot make a definite decision? The amount of “reflection, sheen, gloss”, whatever ya’ wanna’ call it, coming off the top in the first two photos on this page alone seem awfully shiny? I do not see any seams sewn, stitched or otherwise that seem (no pun intended) like they “should be there”? I can see them on black vinyl top Camaros. The only thing I see, is the fact that the trim is there for a vinyl top? With all the products available to make your ish shiny now days, I know it’s not implausible that they just laid the shine on thick! God (or who/whatever) knows that people like that stuff. If that’s the case, they put it on so thick that I can see no texture in the vinyl. I did read the entire BF article & Clist add twice & while BF makes reference to the owner stating that “the vinyl tops are rare” it doesn’t state that this car has one. However, the Clist add states rare vinyl top? I agree. It looks like someone removed the vinyl top and painted the roof. The paint on the roof appears to be in better condition than the rest of the car. My heart skipped a beat. Was either the sight of this car or the triple-decker fatburger I had right before bedtime. @Miguel- This has the rally sport package,so the tailights are different than the base camaros. Also look how GM moved the backup lights to the lower pan. I have heard about the Z-10 pkg. before, but had not seen one until now! What a beauty! $32,500? Seems like a bargain, given what this is. It figures……..another dream comes by and I’m still broke! I’d definitely keep it well maintained and enjoy driving it! That’s what we call “painfully original”! From memory only about 250 – 300 Z-10 coupes were built, but the 400 – 500 estimate cited in the article could be correct. Probably no one knows the exact number. In any event they are very rare. I’ve never seen one in person. Recently I’ve seen photos of another example, without the vinyl top. Personally, the orange houndstooth custom interior is one of the elements that really distinguishes the Z-11, so I’d like to see a Z-10 with that, but I’m not sure Chevrolet built any that way. Have never seen one of these, and there are other mysteries which I’ve also found here. The armrest bases are from a parts car. The plastic of that vintage would crack and fall apart, so the originals are gone. Amazing that any survived, but maybe they are not exact dated replacements? There is no way in my mind that the front seats at least have not been recovered. The vinyl from that era would tear at the piping after just a few years of use. And, they are so perfectly white too. Maybe painted? Speaking of paint, there is no vinyl on that top! Yes, the options list may have indicated an original one, but it is long gone. Someone else mentions how perfect the roof looks. The only vinyl roofs I have ever seen on GM products of this era had a pebbled texture. Possible to replace the vinyl, certainly. Most who remove them also take off the outlining trim, but I am glad to see it here. Lastly, I was not aware that Chevy ever offered that console shifter on any transmission but the TH400. If is is actually a 350, that is news to me!